The Incredible Power of the Mushroom! Dubai, UAE, November 04, 2018: We all dream of healthy hair, nails and skin and this requires a complete nutritional support system paired with the right topical treatments to promote a healthy body from the inside out. Introducing Groh total vitality products, designed to create and master a healthy daily routine to fulfill nutritional needs that a simple diet often fails to provide. Groh offers a dietary supplement and beauty treatments that are formulated to reawaken dormant cells in the hair, scalp, skin, nails, lashes, and eyebrows—as well as support a healthier and more optimised lifestyle. The active ingredient within Groh is ErgoD2® and this potent antioxidant is a combination of amino acids, Ergothioneine and vitamin D2. This natural combination is found within specialty mushroom plants, enriched through a patented process and is incorporated into our proprietary oral supplements and external skin products. ErgoD2® has its own unique specific transporter system within the human body. This transporter is present in the outer cell wall membrane of human cells and is highly expressed in healthy skin, hair, scalp, nails, and lashes. Thus, Groh beauty treatments will work internally and externally within the body’s complex biological system to help support healthy skin, hair, nails and lashes. Daily Vitality Boost Supplement (AED 215) – This is an all-natural supplement that offers nutritional support for cellular function, which results in healthier skin, hair, scalp, nails, and lashes. It contains a blend of 6 specialty mushrooms with known health benefits and will help reduce inflammation, boosts energy, and offers nutritional support to strengthen the body’s immune system. This powerful supplement will help smooth, increase shine, strengthen and stimulate growth in hair. It will also result in radiant, resilient, younger-looking skin with fewer noticeable fine lines and wrinkles – as well strengthening and stimulating the growth of nails. Gentle Cleansing Shampoo (AED 160) – This shampoo is designed to help thicken and grow healthier, more youthful-looking hair. It contains ErgoD2®, which stimulates cellular health through its cultivated blend of natural micronutrients and essential antioxidants for quicker growth, thicker and healthier hair. It also cleanses and helps removes buildup of pollutants and toxins, while regulating excessive sebum production in the hair and scalp. Not to mention that it will help prevent hair from damage caused by heat and styling. Restorative Conditioner (AED 178) – This conditioner replaces key natural nutrients and cofactors needed for cell growth resulting in faster hair growth. It has a weightless formula that helps hair thicken the hair while boosting volume and creating texture. The active ingredient ErgoD2® penetrates deeply to nourish strands, strengthen and increase hair elasticity. It also brings back hair and scalp to good health, as it helps reduce breakage, split ends and controls the inflammatory reaction within the hair cuticle and on the scalp - caused by the use of bleach, hair coloring agents, and heat styling. 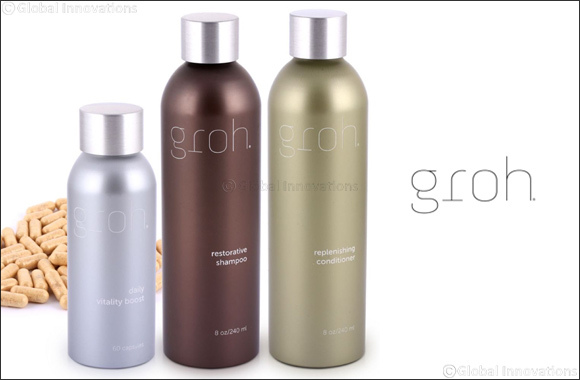 Groh hair products are colour safe do not contain Parabens, Sulfates, Petrochemicals, GMOs, Petroleum or Artificial Colors. Also, the brand does not test on animals. Groh products are available for purchase online from Beautifulbrands.ae.